Addicted to Rubber Stamping: Li'l Tin's Brain Needs Oilin'! Do you know what time it is? Oh yeah, it's Doodle Pantry time! I am so excited about this July release, and I think you are going to be too. 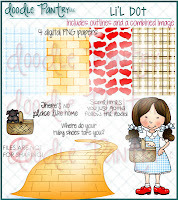 In addition to some fabulous digi sets, Laurie has created an homage to The Wizard of Oz. 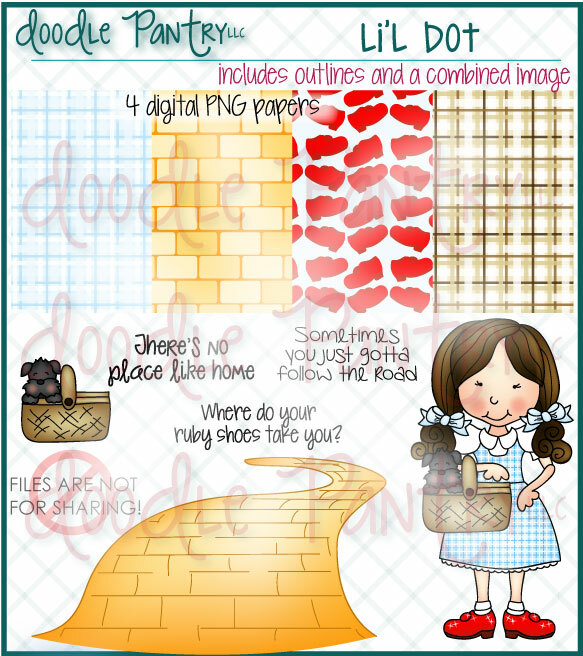 There are 4 individual sets: Li'l Dot, Li'l Roar, Li'l Scare and Li'l Tin; and a bundle called Li'l Oz, that has all four of these sets, plus a combined image of all 4 characters on the brick road and 4 additional curved sentiments. 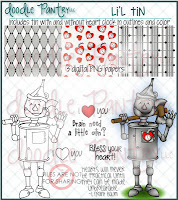 For this release, I chose to use a pre-colored image of the tin man and a sentiment from Li'l Tin. It is an absolutely adorable set, and so much fun to play with. I also used the yellow brick road from the Li'l Dot set. Here is a picture of what you will get in the two sets I used. Using my Fireworks software, I combined the yellow brick road, with Li'l Tin standing on it, and the sentiment into one file. I printed this out twice. I know it's hard to tell, but Li'l Tin is actually dimensional. I hand-cut his hat, body, left hand, knees and shoes and popped them up on top of the original image. I used the Sakura clear glitter pen on all of his bolts to make them stand out a bit. I then added a metal heart on his body. The oil can was cut using my Silhouette Cameo and a cut file from their online store. I used the glitter pen to make it shine. This was layered on a piece of designer paper from the Li'l Tin set. Doodle Pantry is also having a wonderful 4th of July sale from July 1st - 7th. You will get 25% off any of the new July releases (with the exception of Li'l Oz, which has already been reduced). Just use the coupon code JULY25OFF at checkout to receive your discount. You can also get free sets from Doodle Pantry. From now until July 4th, you can get USA Star free. And, when you join Doodle Pantry's Blog Challenge DPDC36 between July 1st and July 24th, you will receive the new Holiday Greetings set free. Thank you for visiting my page. I hope you'll take a few minutes and visit my fellow design team members' pages and see what they have created. They are listed on the right-hand side of my blog. Totally cute - I think this set is going to be a "best" seller for sure. Love them all and what a great job you did with the tin man. Amazing creation. Beautifully crafted and perfectly design. Love the combination of Lil'l Tin with the brick road The addition of the oil can and placement of the sentiment look fantastic! Fabulous card using the 'tin man! I can't wait to use him, he is just so adorable and so is your card Susan.. love it! Great card!! The little heart and oil can are perfect touches!! 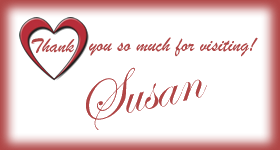 Susan I love how you combined the two! The little heart and oil can are perfect additions!